Samantha Eastwood who was last seen leaving work at Royal Stoke Hospital at 7.45am on Friday, July 27. Detectives in the UK searching for missing midwife Samantha Eastwood have discovered a body in Stoke-On-Trent. 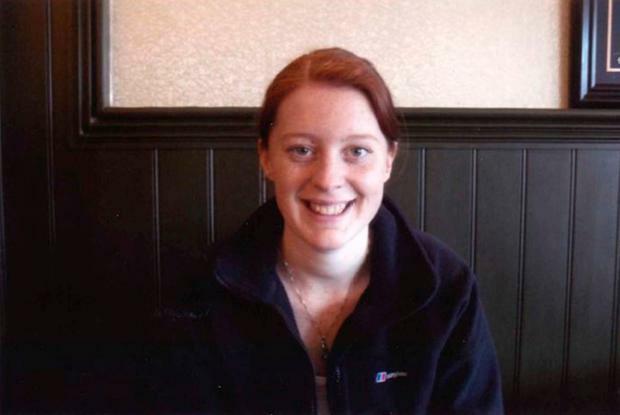 Ms Eastwood (28) vanished last Friday after driving home from a night shift at the Royal Stoke Hospital. Detectives searching for her have confirmed that a body has been discovered and that three men are currently in custody in connection with her disappearance. A 32-year-old man who had previously been arrested by Staffordshire Police in connection with the disappearance has been re-arrested on suspicion of murder. The force said two other men, aged 28 and 60, have been arrested on suspicion of assisting an offender. Forensic teams remain at the scene near Caverswall, Staffordshire and will remain there for some time. Police said the body has yet to be formally identified and a post-mortem will take place in due course. It emerges on Thursday that police are treating the home of her ex-fiance’s brother-in-law as a potential crime scene. Neighbours told police they heard screams coming from her semi-detached house at around 2pm, some six hours after she finished work. Detectives released pictures of her £85 Radley purse, which is missing, and asked for anyone with dashcam footage recorded in north Staffordshire last weekend to come forward. Miss Eastwood had been due to marry John Peake, 34, this June but their engagement was called off in January and Mr Peake moved out of her home. She put her unworn wedding dress up for sale last month. Police have been stationed outside a property belonging to Mr Peake’s sister, Katie Stirling, and her husband Michael, a fencing contractor, since Sunday. An officer outside the address, which is three miles from Miss Eastwood’s home in the Baddeley Green area of Stoke, told reporters the house was being treated as a “scene” and a crime scene log was reportedly visible inside her police vehicle. Another Stoke property connected to the family, whose elderly owner lives in a care home, was searched by forensics experts for several hours, according to neighbours. A neighbour said: “Me and my wife just came back from church and saw two unmarked police cars in the road. Later on a third one came then a fourth. CCTV footage of the midwife leaving work in her blue scrubs last Friday as well as further video footage of her driving her Volvo XC60 away from the hospital has been released by police. Her car was later found at her home, with the keys and bank cards inside her house. Gemma Eastwood, a support worker, said: “Samantha is a fantastic woman and friend. She is warm, friendly, loyal, kind and generous, with a great sense of humour. And whoever she is with she will always make their times together fun. “Samantha was determined to become a midwife from a young age and succeeded. “All of Samantha’s work friends describe her as an amazing midwife. Officers have declined to say whether they have recovered Miss Eastwood’s mobile phone, stating that it was part of an “ongoing investigation”. He asked the public to report any sightings of vehicles parked in “strange locations”, isolated areas, or lay-bys, no matter how inconsequential they may appear.